Chesterfield will play League One football next season after a comprehensive 3-0 win over Bury secured their safety. The nerves that have blighted recent home performances were eradicated in a near perfect first half, Jay O’Shea and Lee Novak on target as Danny Wilson’s men snuffed out the visitors’ threats and played some nice stuff themselves. Chesterfield set off brightly, wingers Gboly Ariyibi and Jamal Campbell-Ryce putting in a decent cross apiece from the left and right respectively. And the hosts looked determined from the off, Dion Donohue reintroducing himself to the action with a bone jarring 50:50 challenge that left Craig requiring treatment. The Spireites had an early penalty claim rejected by the officials, Campbell-Ryce attempting to cross into the box where the ball was blocked by what looked like a raised arm - referee Christopher Sarginson unmoved. Tommy Lee’s first involvement was to drop onto a low bouncing effort from Jacob Mellis, before Sam Hird cut out a dangerous cross in Bury’s first period of pressure 15 minutes in. 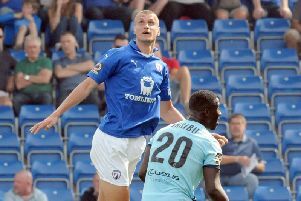 In what was becoming a pattern for Chesterfield, another Campbell-Ryce cross created a threat, Novak twisting to try and direct a header goalwards, a deflection on the cross making it an impossible task. O’Shea came close to an opener with a wonderful curling free-kick from 30 yards, sending it just past the right upright. The first yellow card of the day went to Jones on 25 minutes, his leap onto the back of Aryibi not particularly nasty but it compounded earlier fouls. Chesterfield began to turn the screw, Ariyibi’s ball to the near post headed past his own post by Cian Bolger, the resulting corner creating chaos in the box, Bury surviving. A goal was coming however, and when the run of Liddle was halted in the area by a Bolger bodycheck, the Spireites were handed a penalty, and the Bury man a yellow. O’Shea was the man responsible from 12 yards and made no mistake, sending it to the left, out of the reach of Chris Neal’s despairing dive. Everything was going Chesterfield’s way, Campbell-Ryce skipping past Danny Pugh only to be scythed down for Bury’s third yellow. The Shakers were rocking and had keeper Neal and then the woodwork to thank for keeping the score at 1-0, the stopper palming away O’Shea’s low shot before Ollie Banks thundered the ball off the post from an acute angle. In first half stoppage time Chesterfield took complete control, Novak shooting from 25 yards and finding the bottom corner via a big deflection that took Neal out of the equation entirely. The Proact erupted in relief, a two-goal cushion taking most of the nerves out of the stadium, and the hosts were well worth it after a positive first half performance, underpinned by the steel of Liddle et al. Bury went for a complete overhaul at the break, using all three substitutions - the yellow carded Jones departing along with Tom Pope and Mellis, Danny Rose, Reece Brown and John O’Sullivan introduced. The Shakers were back in trouble with the referee early in the second half, Danny Mayor’s name in the book for dissent. He could have had his name on the scoresheet a couple of minutes later, but delayed instead of shooting when the ball found him in space inside the area, Chesterfield able to get bodies in the way to block and clear. Ryan Lowe became the fifth Bury player to get cautioned when he went in late on Hird, and Mayor was walking a tightrope when he hurled Ariyibi to the deck. Chesterfield’s League One safety was confirmed with an instant impact by substitute Gardner. Two minutes after replacing Campbell-Ryce Gardner streaked away from Ariyibi’s pass, fed O’Shea who took Neal out of the play with a smart touch, got the ball back and tapped into the empty net for a 3-0 lead. What life was left in the Shakers was knocked out of them by that goal, and Chesterfield dominated the rest of proceedings - Ariyibi, O’Shea and Novak linking up brilliantly, Gardner getting involved as well, with a number of half chances created as a result. Gardner could have added a fourth in the final five minutes, the Spireites breaking from yet another Liddle interception, Novak sliding the ball across the box for Gardner, Neal saving with his legs. That was the last meaningful action, save for the departure of Ariyibi and a brief cameo for Connir Dimaio, before full-time signalled safety and a job well done for Wilson’s side. Chesterfield: Lee, Talbot, Donohue, Hird, Anderson, Ariyibi (Dimaio 90), Campbell-Ryce (Gardner 69), Liddle, Banks, O’Shea, Novak. Not used: Evatt, Slew, Ebanks-Blake, Simons, Chapman. Bury: Neal, Pugh, P. Clarke, Bolger, Jones (Brown 46), Mayor, Soares, Mellis (O’Sullivan 46), Etuhu, Pope, Lowe. Not used: Lawlor, Rose, Clare, Sedgwick. Referee: Christopher Sarginson. Assistants: Mark Dwyer, Andrew Newbold.